When a popular revolt forced long-ruling Egyptian President Hosni Mubarak to resign on February 11, 2011, US President Barack Obama hailed the victory of peaceful demonstrators in the heart of the Arab World. 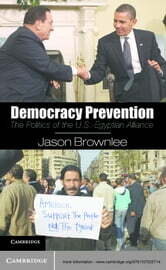 But Washington was late to endorse democracy - for decades the United States favored Egypt's rulers over its people. Since 1979, the United States had provided the Egyptian regime with more than $60 billion in aid and immeasurable political support to secure its main interests in the region: Israeli security and strong relations with Persian Gulf oil producers. During the Egyptian uprising, the White House did not promote popular sovereignty but instead backed an 'orderly transition' to one of Mubarak's cronies. Even after protesters derailed that plan, the anti-democratic US-Egyptian alliance continued. Using untapped primary materials, this book helps explain why authoritarianism has persisted in Egypt with American support, even as policy makers claim to encourage democratic change.